(CNN) -- A friend of mine had a houseguest recently who, while sipping a cup of tea at her kitchen table late at night, broke out into nasty-looking hives all over his back. A quick inspection found that a tick had burrowed its way into his skin. After removing it with a pair of tweezers, she whisked him to the emergency room. 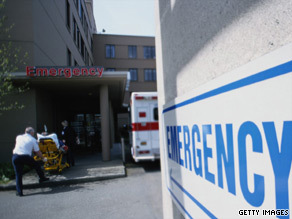 Can name-dropping get you seen faster in a crowded emergency room? "I was really worried," she told me. "Ticks can cause allergic reactions. I wanted him to be seen by a doctor immediately." But when they arrived at the ER, they were told there would be a three-hour wait. Thinking fast, my friend remembered reading the name of the hospital's president; we'll call him John Smith. "I lightheartedly said, 'I wonder what would happen if I called John Smith and woke him up? Would that get him seen any faster?' "
Her houseguest was seen by a doctor immediately. Was my friend being really smart -- or really obnoxious? According to a report out this week, the average total waiting time in a U.S. emergency room in 2008 was four hours and three minutes, a 27-minute increase in nationwide average wait times since 2002. The report by Press Ganey Associates analyzed the experiences of nearly 1.4 million patients treated at more than 1,700 emergency departments nationwide. The recession is one chief reason for the increase, according to the American College of Emergency Physicians. In a survey in January of more than 1,700 emergency doctors, 66 percent said they'd seen an increase in the number of patients in their emergency rooms over the preceding six months. Most of the physicians -- 83 percent -- reported seeing patients who'd lost their jobs and health insurance and delayed medical care. "Some of these people come to the ER because they've been turned away by their primary care physician, because they've lost their insurance," said Dr. Angela Gardner, incoming president of the physicians group. "Sometimes they've delayed care because they have no insurance and end up with a much more serious condition." Gardner, who works in the ER at Parkland Hospital in Dallas, Texas, said these newly uninsured people are taxing an overburdened system. "We're overwhelmed and swamped," she said. Given this situation, I asked four ER doctors what they would do if their spouse had a life-threatening emergency and they felt as if they weren't getting the attention they needed in the emergency room. Although they all pointed out that emergency rooms do an excellent job of triaging patients, and you might have to wait while others who are sicker than you get seen by the doctor, there are some steps you can take if you truly fear that you or your loved one is not getting the care you need. "This would work most of the time. If I got a hostile answer, I would ask to speak with the charge nurse or charge physician. If I felt like I was not getting anywhere, I would ask to speak with the administrator on call. The last resort is to call the hospital operator (dial 0 from the emergency department waiting room phone) and ask to page the patient advocate and hospital administrator. ... I would not use inappropriate or threatening language." "You could say, 'She's not acting right. This is not normal for her.' ... As your friend did, you can always try to drop a big name, like say you're friends with the president of the hospital. In general, if they think you're a VIP (even if you're not), you'll definitely get seen more quickly. ... Obnoxious real VIPs get the fastest service, while obnoxious wannabe VIP liars get the slowest service. "A basic principle of medical care is that 'the squeaky wheel gets the grease.' I would recommend advocating on behalf of your spouse. It's uncomfortable that it has to be this way, but it works the same in any service business. The more you complain, the faster the service. But it's a fine line. Complaining can piss off the staff, so it's important not to go over the top. Family members who are too vocal are sometimes escorted out by security." "I would ask to speak with the Emergency Department director. If they weren't there, I would ask to speak with the charge nurse or shift supervisor. ... I would advise them that you think the patient has an 'emergency medical condition that should be evaluated right away.' Most of us in emergency medicine define the urgency in those terms and should be responsive. "If you don't get a response, advise the individual in charge dispassionately and without confrontation, 'I understand you are busy, but I feel the patient will have a bad outcome if not seen right away.' If the person in charge was a nurse, ask to speak with the physician and repeat the same thing. If there's no response, further advise the individual in charge, 'I feel strongly about this and must call the administrator on call.' If no response, I would call the hospital administrator on call and advise him or her of those same concerns. And yes, name-dropping the administrator's name always helps. It should not. But if you truly feel the patient may suffer harm by not being seen right away, do it." "If you are concerned that a family member or friend is getting sicker while awaiting treatment in the Emergency Department, it's always reasonable to request that the triage nurse do a quick re-assessment of the patient. As far as invoking the threat of a letter to the CEO, that can trigger the 'VIP Care' response, which may save time, but also may expose the patient to increased risk by changing practice patterns. VIP treatment subverts the normal way we practice medicine and in my experience usually leads to medical errors. I have made my worst mistakes while treating friends, colleagues, and other VIPs. ... Belligerence, histrionics or requests for VIP treatment usually end up working against the doctor-patient relationship." In case you were wondering, my friend's houseguest was indeed having an allergic reaction to a tick. He received an antihistamine and antibiotics to prevent infection and is fine and very happy with the care he received in the emergency room.